RaceTrac Coffee For A Cause: Send A Child With Cancer To Camp! 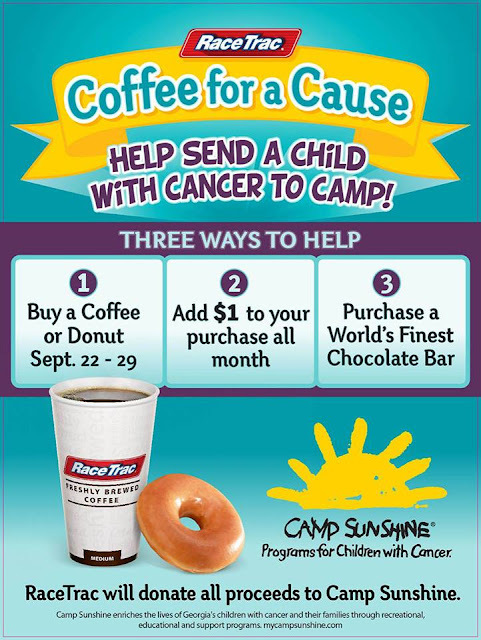 September is Childhood Cancer Awareness Month, which means RaceTrac's annual 'Camp Sunshine Coffee for a Cause' is back in action! All month long, RaceTrac will be supporting Camp Sunshine to help children fighting cancer attend camp in Rutledge, GA.! Please help out by donating $1 or buying a World's Finest Chocolate bar. Every 400 cups of coffee sold at RaceTrac from Sept. 23-29 will fund one child's participation in Camp Sunshine's programs, which are designed to give children with cancer the opportunity to enjoy normal activities like swimming, horseback riding, arts and crafts, and making friends! Buy a cup of RaceTrac coffee Sept. 23-29 or add $1 to your purchase all month to do your part. RaceTrac will donate all proceeds to Camp Sunshine and its program. Camp Sunshine offers a variety of programs, which encompass the entire family - brothers, sisters and parents! A network of support is made up of other families experiencing the challenges of fighting cancer.